A New Jersey construction executive who attacked an FBI witness against corrupt ex-NYPD commissioner Bernie Kerik pleaded guilty Monday to assault for his role in the violent scuffle at the Hudson Hotel two years ago, captured on surveillance video. A New Jersey construction executive who attacked an FBI witness against corrupt ex-NYPD commissioner Bernie Kerik has pleaded guilty to a violation of disorderly conduct for his role in the violent scuffle at the Hudson Hotel two years ago, captured on surveillance video. Frank DiTomasso, 58, took the plea deal in Manhattan Criminal Court and will get no jail time as part of the deal. He was initially arrested for assault. DiTomasso has agreed to attend an anger management classes after admitting attacking his former friend, Larry Ray, a Manhattan district attorney's office spokeswoman said. Ray said he suffered a skull fracture and still has some neurological problems as a result of the assault. Ray said the attack was revenge for his cooperation with the feds against Kerik. A construction executive with ties to disgraced ex-NYPD commissioner Bernie Kerik was arrested Wednesday, months after he allegedly assaulted an FBI information who exposed corruption involving Kerik inside a midtown hotel. Jonathan Dienst reports. But DiTomasso's attorney, Cathy Fleming, said in a statement to News 4 Monday, "The video does not show the whole story. Mr. DiTomasso did not target Larry Ray. He has no concerns about Larry Ray's past cooperation -- it did not affect him." Ray was once good friends with both DiTomasso and Kerik. But Ray’s cooperation with the FBI in the corruption investigation into the former police commissioner helped expose Kerik’s improper acceptance of tens of thousands in free renovations on his then-Riverdale apartment from DiTomasso’s firm, Interstate Industrial. Kerik, the city’s former police and correction commissioner, went to prison for four years. But DiTomasso was never charged in the federal corruption case and has long denied any past ties to organized crime. DiTommasso was charged for allegedly lying to a Bronx grand jury in 2002 in connection with Kerik’s wrongdoing, but was acquitted. 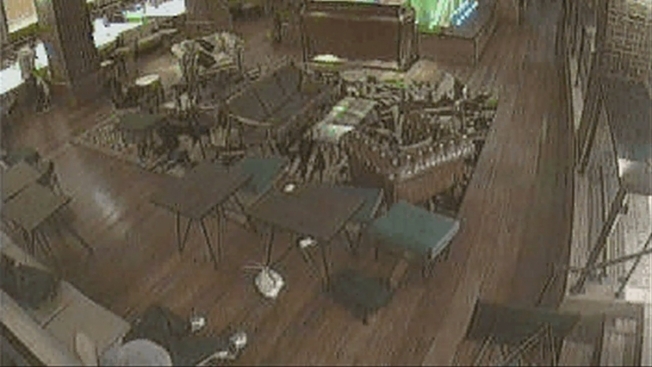 Surveillance video obtained by News 4 shows the attack in which DiTomasso is seen approaching Ray as he is seated in the bar area. DiTomasso then begins punching and kneeing Ray repeatedly. Ray has claimed DiTomasso had a metal ball or pipe in his hand during the assault. DiTomasso was originally arrested on felony assault charge by NYPD detectives. Ray is now suing DiTomasso for damages.